St. Patrick’s Day 2019 — Irish Movies for Families! Happy St. Patrick’s Day! Here are some movies from or set in Ireland for families to enjoy. 1. 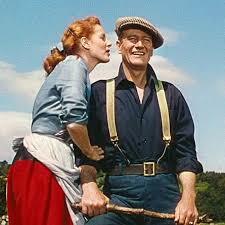 The Quiet Man John Wayne plays American Sean Thornton (John Wayne), who returns to in Innisfree, the small, beautiful Irish village where he was born, to buy his family’s old home. He meets fiery Mary Kate Danaher (Maureen O’Hara), courts her, marries, her, and then really has to win her as both must learn some lessons about intimacy, pride, and trust. Yes, there are some moments that seem sexist but the underlying story is as glorious as the spectacular landscape and as touching as the endearing characters. 2. The Secret of Roan Inish A little Irish girl named Fiona goes to stay with her grandparents and becomes convinced that her baby brother, whose cradle was carried off to sea years before, is alive and being cared for by Selkies, seals who can transform themselves into humans. This is a quiet film, filled with lovely images that convey the magic surrounding anyone who believes in it. It explores themes of loyalty and commitment to family and following your heart. 4. 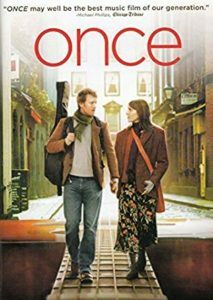 Once The best song Oscar went to this bittersweet film about an Irish musician (Glen Hansard) who meets a pianist and singer (Markéta Irglová) from the Czech Republic. 5. Millions The Oscar-winning director of “Slumdog Millionaire,” Danny Boyle, also shows his gift for working with children in “Millions,” the story of a young boy who finds a bag of money. 6. My Left Foot Daniel Day-Lewis won an Oscar for his portrayal of Christy Brown in this true story of a writer and painter who was paralyzed and could only use his left foot — and of his indomitable mother (Oscar-winner Brenda Fricker). 7. The Secret of Kells This quietly exquisite animated film was a surprise Oscar nominee. It is about an 11th century boy who lives in a monastery run by his stern uncle and the gorgeous illuminated manuscript that changes his life. 8. Circle of Friends Minnie Driver and Chris O’Donnell star in Maeve Binchy’s story of love and friendship in 1950’s Ireland. 9. “Hear My Song” A fast-talking small-time promoter has to persuade a retired performer to sing again. 10. In the Name of the Father Day-Lewis again, in another true story, this time the story of a father and son who were imprisoned for an IRA bombing. Emma Thompson plays his dedicated lawyer and Pete Postlethwaite was nominated for an Oscar as the father who ends up in prison as well. Throughout cinema history, films by and about women have enthralled audiences, accrued awards and honors worldwide and scored at the box office while influencing out social social mores and enriching our cultural conversation. Although some Hollywood honchos and haters assert that female-centric movies are less likely to be commercial successes, our list proves them wrong. Movies that tell women’s stories have legs. Released to celebrate Women’s History Month, AWFJ’s REAL REEL WOMEN List is an annotated roster of 50 fascinating real women whose remarkable true stories have been told in narrative features since the earliest days of moviemaking. The REAL REEL WOMEN List is a companion to AWFJ’s WONDER WOMEN List of iconic fictional females, published as a five-part countdown series in 2016. AWFJ members selected our 50 iconic REAL REEL WOMEN from more than 150 nominees, all of whom have had their stories told in watch-worthy films. Short essays about our REAL REEL WOMEN’s lives, accomplishments and the films made about them have been written by AWFJ members Betsy Bozdech, Liz Braun, Sandie Angulo Chen, Carol Cling, Leslie Combemale, Linda Cook, Laura Emerick, Marilyn Ferdinand, Alexandra Heller-Nicholas, Kimberley Jones, Loren King, Sarah Knight Adamson, Cate Marquis, Brandy McDonnell, Jennifer Merin, Nell Minow, Lynn Venhaus, and Susan Wloszczyna. We hope that reading about these REAL REEL princesses and pilots, artists and actors, poets, political activists and other women from all walks of life will prompt you to add all the films about them to your watch list, and that you’ll then be motivated to seek out and enjoy additional current and classic movies about other real women whose stories are memorialized in cinema. Fanny Brice, born Fania Borach, was the daughter of Jewish immigrants who dropped out of school as a teenager to work in burlesque and began her association with vaudeville impresario Flo Ziegfeld two years later. She headlined the Ziegfeld Follies from 1910 through part of the 1930s. Best known in sketch comedy as bratty little girl “Baby Snooks” and performing songs like the comically self-deprecatory “Second Hand Rose,” her signature was the heartbreaking torch song, “My Man,” which inspired her first film, My Man (1928). She played herself in the Oscar-winning The Great Ziegfeld (1936), acted in several other films, and had a hit on radio with the “The Baby Snooks Show,” but there is no question that her own fame has been eclipsed by the performer who starred as Brice on Broadway and in her first film—Oscar-winner Barbra Streisand in Funny Girl (1968). It was a perfect match—one brash, prodigiously talented, unconventionally pretty, New York Jewish singer equally adept at comedy and drama portraying another. Streisand sings “Second Hand Rose,” “My Man,” and original songs created for the Broadway show, including the now-standard “People.” The story of Brice’s determination and resilience despite the heartbreak of her marriage to a handsome scoundrel is now a classic and prompted a sequel, also starring Streisand, that told more of Brice’s story, 1975’s Funny Lady. Brice helped pave the way for unconventional-looking lead performers, and her few films are well worth watching. Pure pleasure, and a powerful reminder of why the members of the Motion Picture Academy reacted so strongly when the producers of the Oscar telecast tried to take the award for best cinematography off the broadcast. Here’s a look at the Best Cinematography Oscar winners. Next PostNext Join Me (Virtually) To Watch the Oscars! The Library of Congress announced Wednesday that the films Jurassic Park, Brokeback Mountain and My Fair Lady are among the 25 movies tapped for preservation this year. A forbidden love affair, the ravages of alcoholism, an animated classic, a kiss that broke the color barrier and dinosaurs returned from extinction represent the diversity of the class of 2018. This year’s films span 107 years, from 1898 to 2005. They include blockbusters, documentaries, silent movies, animation and independent films. The 2018 selections bring the number of films in the registry to 750, which is a small fraction of the Library’s vast moving-image collection of 1.3 million. The public can tune into Turner Classic Movies (TCM) at 8 p.m. E.T. tonight to view a selection of motion pictures named to the registry this year. The Librarian joins movie critic Leonard Maltin to discuss the films. Also, select titles from 30 years of the National Film Registry are also freely available online in the National Screening Room. Follow the conversation about the class of 2018 on Twitter at @librarycongress and #NatFilmRegistry. Two contemporary Western dramas headline this year’s list: the 1961 “One-Eyed Jacks,” Marlon Brando’s only directorial endeavor, and Ang Lee’s critically acclaimed “Brokeback Mountain.” Released in 2005, “Brokeback Mountain” also has the distinction of becoming the newest film on the registry while the 1891 “Newark Athlete” actuality is the oldest. Music is spotlighted in the popular 1949 musical “On the Town,” starring Gene Kelly, Frank Sinatra and Jules Munshin as three sailors on shore leave in New York City. Also included is the seminal music-festival film “Monterey Pop,” featuring some of the biggest names in music. It was directed by D.A. Pennebaker and produced by John Phillips and Lou Adler. 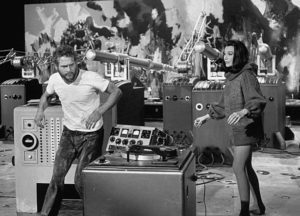 “I am extremely pleased and proud as I am sure John Phillips would be that ‘Monterey Pop’ has been selected for inclusion in the National Film Registry,” said Adler. “Pleased that the film brings recognition to the artists involved in a cultural explosion of music festivals and celebrates a generation in tune with music and love. Several films on the registry showcased the ethnic diversity of American cinema. Footage from the Dixon-Wanamaker expedition in 1908 provides glimpses into the lives and culture of various Native American tribes. This year’s list also includes a contemporary film showcasing Native Americans in “Smoke Signals” (1998). It was the first feature film to be written, directed and co-produced by American Indians. The 1997 “Eve’s Bayou” was written and directed by black female director Kasi Lemmons and co-produced by Samuel L. Jackson, who stars in this family drama. African-Americans are also shown kissing in a 29-second silent film. Shot in 1898, it is the earliest known footage of black intimacy on screen. Other silent film titles include the 1917 “The Girl Without a Soul” and Buster Keaton’s 1924 “The Navigator.” In 2013, the Library of Congress released a report that conclusively determined that 70 percent of the nation’s silent feature films have been lost forever and only 14 percent exist in their original 35 mm format. “The Informer,” the 1935 drama that takes place during the Irish Rebellion of 1922, becomes the 11thfilm directed by John Ford to be named to the registry, the most of any other director. Other titles on the registry include the 1953 “Pickup on South Street,” the 1955 “Bad Day at Black Rock” and the Academy Award-winning Vietnam documentary “Hearts and Minds” (1974), directed by Peter Davis. Under the terms of the National Film Preservation Act, each year the Librarian of Congress names to the National Film Registry 25 motion pictures that are “culturally, historically or aesthetically” significant. The films must be at least 10 years old. More information about the National Film Registry can be found at loc.gov/film. The Librarian makes the annual registry selections after conferring with the distinguished members of the National Film Preservation Board (NFPB) and a cadre of Library specialists. Also considered were more than 6,300 titles nominated by the public. Nominations for next year will be accepted through the fall at loc.gov/programs/national-film-preservation-board/film-registry/nominate/. Many titles named to the registry have already been preserved by the copyright holders, filmmakers or other archives. In cases where a selected title has not already been preserved, the Library of Congress Packard Campus for Audio Visual Conservation works to ensure that the film will be preserved by some entity and available for future generations, either through the Library’s motion picture preservation program or through collaborative ventures with other archives, motion picture studios and independent filmmakers. The Packard Campus is a state-of-the-art facility where the nation’s library acquires, preserves and provides access to the world’s largest and most comprehensive collection of films, television programs, radio broadcasts and sound recordings (loc.gov/avconservation/). It is home to more than 7 million collection items. Bad Day at Black Rock (1955) Though only 81 minutes in length, “Bad Day” packs a punch. Spencer Tracy stars as Macreedy, a one-armed man who arrives unexpectedly one day at the sleepy desert town of Black Rock. He is just as tight-lipped at first about the reason for his visit as the residents of Black Rock are about the details of their town. However, when Macreedy announces that he is looking for a former Japanese-American Black Rock resident named Komoko, town skeletons suddenly burst into the open. In addition to Tracy, the standout cast includes Robert Ryan, Anne Francis, Lee Marvin, Ernest Borgnine and Dean Jagger. Director John Sturges displays the western landscape to great advantage in this CinemaScope production. Broadcast News (1987) James L. Brooks wrote, produced and directed this comedy set in the fast-paced, tumultuous world of television news. Shot mostly in dozens of locations around the Washington, D.C. area, the film stars Holly Hunter, William Hurt and Albert Brooks. Brooks makes the most of his everyman persona serving as Holly Hunter’s romantic back-up plan while she pursues the handsome but vacuous Hurt. Against the backdrop of broadcast journalism (and various debates about journalist ethics), a grown-up romantic comedy plays out in a smart, savvy and fluff-free story whose humor is matched only by its honesty. Brokeback Mountain (2005) “Brokeback Mountain,” a contemporary Western drama that won the Academy Award for best screenplay (by Larry McMurtry and Diana Ossana) and Golden Globe awards for best drama, director (Ang Lee) and screenplay, depicts a secret and tragic love affair between two closeted gay ranch hands. They furtively pursue a 20-year relationship despite marriages and parenthood until one of them dies violently, reportedly by accident, but possibly, as the surviving lover fears, in a brutal attack. Annie Proulx, the Pulitzer Prize-winning author of the short story upon which the film was based, described it as “a story of destructive rural homophobia.” Haunting in its unsentimental depiction of longing, lonesomeness, pretense, sexual repression and ultimately love, “Brokeback Mountain” features Heath Ledger’s remarkable performance that conveys a lifetime of self-torment through a pained demeanor, near inarticulate speech and constricted, lugubrious movements. In his review, Newsweek’s David Ansen wrotes that the film was “a watershed in mainstream movies, the first gay love story with A-list Hollywood stars.” “Brokeback Mountain” has become an enduring classic. Cinderella (1950) It would take the enchanted magic of Walt Disney and his extraordinary team to revitalize a story as old as Cinderella. Yet, in 1950, Disney and his animators did just that with this version of the classic tale. Sparkling songs, high-production value and bright voice performances have made this film a classic from its premiere. Though often told and repeated across all types of media, Disney’s lovely take has become the definitive version of this classic story about a girl, a prince and a single glass slipper. Breathtaking animation fills every scene, including what was reportedly Walt Disney’s favorite of all Disney animation sequences: the fairy godmother transforming Cinderella’s “rags” into an exquisite gown and glass slippers. Days of Wine and Roses (1962) “Days of Wine and Roses” marked another in a series of Hollywood classics on the touchy subject of alcoholism. Previous examples on the theme include “The Lost Weekend” and “Come Back, Little Sheba.” Though his career prior to “Days” had been noted for a deft touch in light comedy, in this Academy Award-nominated performance, Jack Lemmon plays a hard-drinking San Francisco public-relations man who drags his wife Lee Remick into the horrific descent into alcoholism. Director Blake Edwards pulls no punches in this uncompromisingly bleak film. Henry Mancini composed the moving score, best remembered for the title song he and Johnny Mercer wrote, which won an Academy Award for best original song. Dixon-Wanamaker Expedition to Crow Agency (1908) The original nitrate footage that comprises the 1908 “Dixon-Wanamaker Expedition to Crow Agency” was discovered in a Montana antique store in 1982 and subsequently donated to the Human Studies Film Archives, Smithsonian Institution. It is the only known surviving film footage from the 1908 Rodman Wanamaker-sponsored expedition to record American Indian life in the west, filmed and produced both for an educational screening at Wanamaker’s department store in Philadelphia and to document what Wanamaker and photographer Joseph K. Dixon considered a “vanishing race.” Dixon and his son Roland shot motion picture film as well as thousands of photographs (most of the photographs are archived at Indiana University). This film captures life on Crow Agency, Crow Fair and a recreation of the Battle of Little Big Horn featuring four of Custer’s Crow scouts. Films from later Wanamaker expeditions are archived at the National Archives and the American Museum of Natural History. The original film was photochemically preserved at Cinema Arts in 1983. The Girl Without a Soul (1917) George Eastman Museum founding film curator James Card was a passionate devotee of silent film director John H. Collins’ work. It is through his influence that the museum is the principal repository of the director’s few extant films. As the expert on Collins’ legacy, the museum said he is “one of the great ‘What if…?’ figures of American cinema—a brilliantly creative filmmaker who went from being a costume department assistant to a major director within four short years, before dying at the age of 31 in the 1918 influenza pandemic. Collins’ films show both a subtle understanding of human nature and often breathtakingly daring cinematography and editing. The ‘Girl Without a Soul’ stars Viola Dana (to whom Collins was married) in a dual role as twin sisters, one of whom is a gifted violinist, and the other, a deeply troubled girl jealous of her sister’s abilities and the love bestowed upon her by their violinmaker father. This jealousy and the violinist sister’s unworldliness lead both into turbulent moral conflict, which takes considerable fortitude from both to overcome.” “The Girl Without a Soul” has been preserved by George Eastman Museum. Hearts and Minds (1974) Director Peter Davis describes his Academy Award-winning documentary “Hearts and Minds” (1974) as “an attempt to examine why we went to Vietnam, what we did there and what the experience did to us.” Compared by critics at the time to Marcel Ophuls’ acclaimed documentary “The Sorrow and the Pity” (1971), “Hearts and Minds,” similarly addressed the wartime effects of national myths and prejudices by juxtaposing interviews of government officials, soldiers, peasants and parents, cinéma vérité scenes shot on the home front and in South Vietnam, clips from ideological Cold War movies, and horrific archival footage. Author Frances FitzGerald praised the documentary as “the most moving film I’ve ever seen on Vietnam, because, for the first time, the camera lingers on the faces of Vietnamese and one hears their voices.” Author David Halberstam said it “brilliantly catches … the hidden, unconscious racism of the war.” Others from both ends of the political spectrum chided it as manipulative propaganda that oversimplified complexities. Jurassic Park (1993) The concept of people somehow existing in the age of dinosaurs (or dinosaurs somehow existing in the age of people) has been explored in film and on television numerous times. No treatment, however, has ever been done with more skill, flair or popcorn-chomping excitement than this 1993 blockbuster. Set on a remote island where a man’s toying with evolution has run amok, this Steven Spielberg classic ranks as the epitome of the summer blockbuster. “Jurassic Park” was the top public vote-getter this year. The Lady From Shanghai (1947) The camera is the star in this stylish film noir. “Lady From Shanghai” is renowned for its stunning set pieces, the “Aquarium” scene, “Hall of Mirrors” climax, baroque cinematography and convoluted plot. Director Orson Welles had burst on the scene with “Citizen Kane” in 1941 and “The Magnificent Ambersons” in 1942, but had increasingly become seen as difficult to work with by the studios. As a result, Welles spent most of his career outside the studio sphere. “The Lady From Shanghai” marked one of his last films under a major studio (Columbia) with Welles and the executives frequently clashing over the budget, final editing of the film and the release date. Leave Her to Heaven (1945) Darkness and claustrophobia mark the visual style of many film noirs: the use of black-and-white or gloomy grays, low-key lighting, striking contrasts between light and dark, shadows, nighttime or interior settings and rain-soaked streets. “Leave Her to Heaven” proves the magnificent exception. Filmed in vibrant, three-strip Technicolor, many pivotal scenes occur in spectacular outdoor locations, shot by famed cinematographer Leon Shamroy in Arizona and California. A classic femme fatale, Gene Tierney stars as Ellen, whose charisma and stunning visage mask a possessive, sociopathic soul triggered by “loving too much.” Anyone who stands between her and those she obsessively loves tend to meet “accidental” deaths, most famously a teen boy who drowns in a chilling scene. Martin Scorsese has labeled “Heaven” as among his all-time favorite films and Tierney one of film’s most underrated actresses. “Leave Her to Heaven” makes a supremely compelling case for these sentiments. Monterey Pop (1968) This seminal music-festival film captures the culture of the time and performances from iconic musical talent. “Monterey Pop” also established the template for multi-camera documentary productions of this kind, predating both “Woodstock” and “Gimme Shelter.” In addition to director D. A. Pennebaker, Richard Leacock, Albert Maysles and others provided the superb camerawork. Performers include Janis Joplin, Jimi Hendrix, Otis Redding, Hugh Masekela, The Who, Jefferson Airplane, Simon and Garfunkel, and Ravi Shankar. As he recalled in a 2006 Washington Post article, Pennebaker decided to shoot and record the film using five portable 16mm cameras equipped with synchronized sound recording devices, while producers Lou Adler and John Phillips (Mamas and Papas) sagely had the whole concert filmed and recorded, and further enhanced the sound by hiring Wally Heider and his state-of-the-art mobile recording studio. My Fair Lady (1964) In the 1950s and 1960s, besieged by shifts in demographics and having much of its audience syphoned off by television, film studios knew they had to go big in their entertainment in order to lure people back to the theater. This film version of the musical “My Fair Lady” epitomized this approach with use of wide-screen technologies. Based on the sparkling stage musical (inspired by George Bernard Shaw’s play “Pygmalion”), “My Fair Lady” came to the big screen via the expert handling of director George Cukor. Cecil Beaton’s costume designs provided further panache, along with his, Gene Allen’s and George James Hopkins’ art and set direction. The film starred Rex Harrison, repeating his career-defining stage role as Professor Henry Higgins, and Audrey Hepburn (whose singing voice was dubbed by frequent “ghoster” Marni Nixon), as the Cockney girl, Eliza Doolittle. Though opulent in the extreme, all these elements blend perfectly to make “My Fair Lady” the enchanting entertainment that it remains today. The Navigator (1924) Buster Keaton burst onto the scene in 1920 with the dazzling two-reeler “One Week.” His feature “The Navigator” proved a huge commercial success and put Keaton in the company of Harold Lloyd and Charlie Chaplin in terms of audience popularity and films eagerly awaited by critics. Decades after release, Pauline Kael reviewed the film: “Arguably, Buster Keaton’s finest — but amongst the Keaton riches can one be sure?” Keaton plays an inept, foppish millionaire whose idea of a marriage proposal involves crossing the street in a chauffeured car, handing flowers to his girlfriend and popping the question. Later the two accidentally become stranded at sea on an abandoned boat and Keaton proves his worth by conceiving ingenious work-arounds to ensure they survive. The silent era rarely saw films rife with more creativity and imaginative gags. One-Eyed Jacks (1961) Based on the 1956 Charles Neider novel, “The Authentic Death of Hendry Jones” (a loose retelling of the story of Pat Garrett and Billy the Kid), this Western marks Marlon Brando’s sole directorial effort. “One-Eyed Jacks” displays his trademark introspection and offbeat quirkiness. Brando’s novel approach to updating the Western film genre marks it as a key work in the transition period from Classic Hollywood (1930s through 1950s) to the new era that began in the 1960s and continues to the present day. As director Martin Scorsese and others have said, this evolution from “Old Hollywood” to “New Hollywood” involved a change from filmmaking primarily being about profit-making to a period when many directors create motion pictures as personal artistic expression. Pickup on South Street (1953) Samuel Fuller’s films are sometimes compared to the pulp novels of Mickey Spillane, though Fuller’s dynamic style dwarfs Spillane. With films often crass but always provocative, Fuller described his mantra of filmmaking: “Film is like a battleground, with love, hate, action, violence, death … in one word, emotion.” Considered by some as the archetypal Sam Fuller film and a nice summary of the main themes in his work, “Pickup on South Street” is a taut, Cold War thriller. The fast-paced plot follows a professional pickpocket who accidently lifts some secret microfilm from his mark. Patriotism or profit? Soon, the thief is being pursued not only by the woman he stole from, but also by Communist spies and U.S. government agents. The film culminates in a landmark brutal subway-based fight scene. It is arguably the classic anti-Communist film of the 1950s and a dazzling display of the seedy New York underlife. In particular, Thelma Ritter’s excellent tough-yet-nuanced performance as Moe Williams stands out and earned her an Academy Award nomination for best supporting actress, which was highly unusual for what was considered at the time a lurid and violent B-movie. Rebecca (1940) “Rebecca,” Daphne du Maurier’s most famous book (“Last night I dreamt I went to Manderley again…”), found its perfect cinematic interpreter in Alfred Hitchcock, here directing his first American motion picture. Powerhouse producer David O. Selznick had just imported the “master of suspense” from his native England. Laurence Olivier stars as Maxim de Winter and Joan Fontaine in her breakthrough role co-stars as Maxim’s new (and never given a first name) wife. However, it is two other women who dominate the film—the intimidating housekeeper Mrs. Danvers (played by Judith Anderson) and the film’s title woman, the deceased first Mrs. de Winter whose powerful shadow still hangs heavily over this great estate and all its inhabitants. Winner of the Oscar for best picture that year, “Rebecca” is stylish, suspenseful and a classic. The Shining (1980) Director Stanley Kubrick’s take on Stephen King’s terrifying novel has only grown in esteem through the years. The film is inventive in visual style, symbolism and narrative as only a Kubrick film can be. Long but multi-layered, “The Shining” contains stunning visuals — rivers of blood cascading down deserted hotel hallways, disturbing snowy mazes and a mysterious set of appearing and disappearing twins — with iconic performances by Jack Nicholson and Shelley Duvall. Smoke Signals (1998) Native American directors are a rarity in Hollywood. After the early silent film pioneers James Young Deer and Edwin Carewe, the portrayal of Native Americans in cinema turned dark and stereotypical. These social trends started changing with motion pictures like the groundbreaking “Smoke Signals,” generally considered to be the first feature film written, directed and produced by Native Americans. Director Chris Eyre uses the relaxed road-movie concept to create a funny and unpretentious look at Native Americans in the nation’s cinema and culture. The mostly Native American cast features Adam Beach and Evan Adams as the two road warriors who find themselves on a hilarious adventure. Beneath the highly entertaining façade, the film acquainted non-Native American audiences with real insights into the indigenous Americans’ culture. Sherman Alexie penned the witty, droll script based his book “The Lone Ranger and Tonto Fistfight in Heaven.” This Miramax release was a big hit on the independent film circuit and won numerous awards, including a Sundance award. Many thanks to William Topaz and inmyarea.com for inviting me to create a list of killer robots in the movies. Of course it has classics like “Terminator” and “Metropolis,” and some off-beat choices like the Fembots in “Austin Powers,” but I’m pretty sure I’m the only one to include “What a Way to Go!” with Paul Newman and Shirley MacLaine.